Mitchell was born in 1818 and grew up on Nantucket Island, off the coast of Massachusetts. Her father, William Mitchell, bank teller and private school teacher, maintained a small observatory; he guided her studies in astronomy and enlisted her to time a solar eclipse when she was 12 years old. Her formal education ended when she reached age 16, and she did not go to college, as there was only one college in the United States that accepted women at that time. She worked as a librarian at the Nantucket Library for 20 years and read the most challenging treatises available in mathematics and science. On October 1, 1847, Mitchell discovered a new comet using a two­ inch telescope from the roof of her family home. This discovery, which was later referred to as “Miss Mitchell’s comet,” earned her a gold medal from the King of Denmark. In 1848 she became the first woman elected to the Academy of Arts and Sciences in Boston. (For nearly 100 years—until 1943—no other woman was elected to the Academy.) She was hired by the U.S. Coast Survey to compute tables on daily planetary positions for its nautical almanac, work she continued for 19 years. In 1853 she was awarded an honorary degree from Hanover College, Indiana, the first given to a woman by an American college. Mitchell went on to become one of the most noted American astronomers of her time. 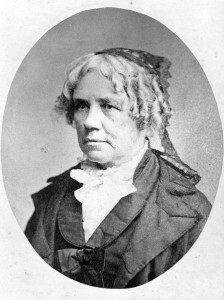 When Vassar College opened in 1865, Mitchell was asked to join the faculty, and became America’s first woman astronomy professor. She was also appointed director of the observatory at Vassar College, which had a 12­inch telescope, the third­ largest telescope in America at that time. Her research at Vassar included solar astronomy and observations of the planetary surfaces of Jupiter and Saturn. In 1873 she began taking daily photographs of the Sun, the first such series made in the United States. Unlike other observers who described sunspots as clouds in the solar atmosphere, she saw them as cooler vortices of gas on the surface of the Sun. She studied the four satellites of Jupiter visible with Vassar’s telescope and hypothesized that their covering was ice or frozen gas; she noticed that the rings of Saturn were of a different texture and composition than the planet itself. She observed that nebulae vary in luminosity over time and guessed that they must route as well as revolve around each other. Mitchell worked as professor of astronomy at Vassar College until she retired on December 25, 1888. Throughout her academic career, she worked for the advancement of women: she lobbied for women’s employment rights, worked on boards of trustees of women’s colleges, and fought against paying women in academia less than men. Mitchell died in Lynn, Massachusetts, on June 28, 1889. As a pioneer in telescopic astronomy and a popularizer of findings that expanded peoples ideas of the size and scope of the universe, Maria Mitchell was one of the best­known American scientists of the nineteenth century. After her death a crater on the moon was named for her, as was a public school in Denver. Her encouragement of women as scientists is a lesser known but lasting legacy She helped advance the status of women at a time when basic women’s rights were a source of controversy and even ridicule. In her lobbying efforts and work on college boards of trustees, she drew attention to issues that, unfortunately, continued to hobble women for another century. Mitchell was a teacher who insisted on challenging women to do rigorous work, to acquire the tools of mathematics and the critical spirit of science, and to plan for marriage and careers simultaneously. “A sphere is not made up of one, but of an infinite number of circles; women have diverse gifts and to say that women’s sphere is the family circle is a mathematical absurdity,’ she wrote. Her legacy can be measured in the accomplishments of her students; a half century after her death, 25 of Mitchell’s students were listed in Who’s Who in America for accomplishments in science. Posted on March 10, 2015 by Natalie. This entry was posted in Astronomers. Bookmark the permalink.